Episode 108 - Everybody Wants Some!! Writer/director Richard Linklater's follow up to his 12-years-in-the-making opus Boyhood has arrived and, apparently, Everybody Wants Some!! This "spiritual sequel" to Dazed and Confused has plenty of laughs, pot smoking, dudes being dudes, and hanging out. Check out what the guys thought of his latest laid-back flick. This week, the guys discuss Dirty Wars, an Academy Award nominee for Best Documentary Feature. A gritty film with a dire message this makes for an interesting first documentary on the show. Also, it takes the guys about 30 seconds to crack a "dirty whores" joke. Steven Spielberg's epic Schindler's List won the Academy Award for Best Picture in 1993. It went on to win six additional Oscars and has earned a spot on almost every "Best Movie" list written since. Hear what the guys think about this Best Picture Winner. Also, hear Mike struggle to respectfully tear the movie apart. 2014 was an incredible year for movies. There were low points, to be sure, but there were some terrific reasons to go to the movies as well. In this episode, the guys discuss their Top 5 and Bottom 5 movies for the year. Check out the episode and share your thoughts in the comments below! So....you've never heard of this movie. And that's OK. There are probably loads of movies you have never heard of - it's nothing to feel bad about. Seriously, think of all of the movies that are produced each year. How many do you get the chance to see? Honestly. Not as many as you'd like? Sure. So, did you catch this one from 2013? No. But that's OK. We watched it. And we're frickin' pumped to have you listen to the podcast about it. The episode is a whopper - lots of fun. Daring. Strange. Hilarious. Original. This is what we talk about when we talk about Birdman, the new film from Alejandro G. Inarritu. Michael Keaton delivers the best performance of his career and is supported by an A-list cast who all deliver the goods. Check out what the guys thought of Birdman, one of the coolest and strangest films of year. This week's episode features a discussion about the Academy Award winner for Best Picture from 1969, Midnight Cowboy, starring Jon Voight and Dustin Hoffman. This movie was the only Best Picture winner to be rated X. You could say "this isn't your father's x-rated movie." Unless, of course, your father watches x-rated movies. Well, it still isn't what you are thinking of. Or even what your father is thinking of. Either way, the movie was re-rated as R a few years after its original release. So, I guess it is now an R-rated Best Picture winner - and there are a ton of those. Give the episode a listen to hear what the guys thought of the film. Last week, the guys proved that two heads are really bad but three heads are ridiculously good. Well, how about FOUR heads?!? Or two sets of doubles? Thus, a double feature. 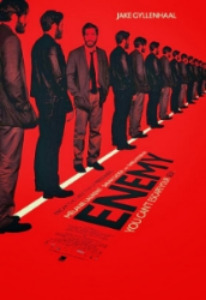 One film is The Double starring Jesse Eisenberg playing two roles and the other is Enemy (based upon a book called The Double) with Jake Gyllenhaal as two characters. See how Hollywood's obsession with actors playing multiple roles holds up in these two films from 2013. Anyone out there love Star Wars? How about Obi-Wan Kenobi? Anyone interested in seeing Sir Alec Guinness play a starched military commander who goes slightly bonkers while being held in captivity? This week, the guys discuss the 1958 Best Picture Academy Award Winning Film The Bridge on the River Kwai. This movie ranks 13th on the AFI's Top 100 Movies of All Time. It won a total of 7 Oscars. Check out the episode to hear what the guys thought of it and sound off in the comments section below. This week's episode finds the guys discussing the 2013 British film Locke starring Tom Hardy. In the film, Hardy's character - Ivan Locke - finds himself having one hell of a bad night. If you enjoy watching people drive, deciphering car speaker phone conversations in heavy British accents, and stress, this movie may be your ticket. Find out what the guys thought by listening to the episode and then sound off in the comments section below. This week the guys took the opportunity to watch and discuss Good Morning, Vietnam - the movie which earned Robin Williams his first Academy Award nomination for Best Actor. He was nominated three times in four years, ultimately winning Best Supporting Actor years later for Good Will Hunting. Whether you are seeing it again for the first time in a while (like Danny) or seeing it for the very first time (like Mike), the movie is worth discussing. Check out what the guys thought of it and leave any comments below. Were you a fan of this year's summer hit Godzilla? Did you wonder how in the heck writer/director Gareth Edwards got the job making that film? And how he parlayed that into a gig in the new Star Wars Universe? Either way, we've got you covered this week. The guys take a look at the 2010 micro-budgeted sci-fi film Monsters written and directed by Gareth Edwards. Enjoy the episode and voice your opinion in the comments section below! OK, so this movie is pretty crazy. In addition to having one of the best movie posters in recent memory, Escape From Tomorrow boasts definite guerrilla bona fides. The movie, shot illegally at Walt Disney World and Disneyland, tells the story of one man losing his grip on reality while vacationing with his family at the theme park. Prepared to be thoroughly creeped out. Check out the episode to hear what the guys thought of it and leave your thoughts in the comments section.